My first visit to Bent was back in late 2012, close to its opening. I was pleased with my experience and their strongly flavoured dishes (read review here) with only complaints being on their service (not changing plates and offering serving utensils). 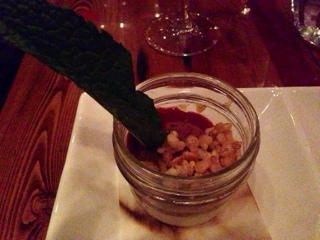 While revisiting Bent for their 2014 Winterlicious menu ($35 for three courses), they were as busy as ever. Service continues to be friendly and helpful with our waitress providing point on descriptions of the dishes and stepping in quickly to address some spilt wine. The food was enjoyable still incorporating Susur’s bold Asian European fusion flavours and was somewhat sharable small plate formats. The black pepper charred salmon arrives with a side of spicy salmon tartare, a nice contrast to the calmer seared pieces. Both were very different with the slices cooked with just a simple sear and a pepper/dill crust. Topped with crème fraiche, a fennel relish, pumpkin seeds, pomegranate seeds and a dill vinaigrette there was a certainly a host of different textures and flavours. All in all, it works but a bit too much dill for my taste as I found the piece on the right of the plate (away from the vinaigrette) a better combination. Meanwhile, the salmon tartare is similar to their “tartare two ways” offering with a smooth salmon paste mixed with crunchy shallots, more dill and something briny. A nice amount of heat is incorporated into the mixture and gave it a punch. I’ll admit, it tastes much better on top of a crispy sushi rice cake, the salty potato chips doesn’t work quite as well. 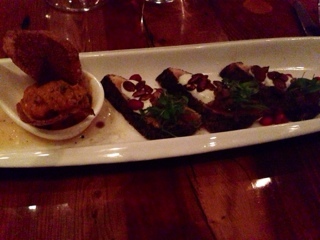 My friend and I split our mains as the shrimp ravioli and short rib cannelloni both sounded delicious. The shrimp ravioli was an impressively presented dish with a lot going on. The ravioli is made exactly how I like it, a higher filling to dough ratio, with light wonton skins acting as the dough and a sweet peppered shrimp paste as the filling. 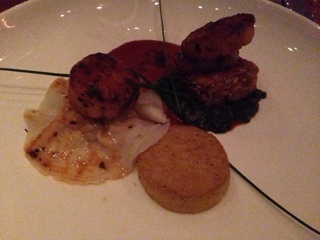 Nicely seared scallops topped the ravioli and rice cake / creamed swiss chard combination while a seafood tofu (?) medallion rounds off everything. All in all, this is the dish to have if you’re not going to share as there’s enough going on within it to keep things interesting and really showcases what Susur does best – mixing different ingredients, textures and flavours. 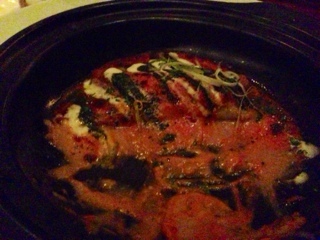 I apologize for the disheveled looking short rib cannelloni … I forgot to snap the picture before it was split. If you’re planning to share mains with someone else, my suggestion is to have the other dish first and leave this until the end. The cannelloni is filled with robust flavours – tender pulled short rib, a rich red pepper and garlic gravy and some parsley (?) puree and gorgonzola cream. It’s a much heavier dish and reminded me of eating an enchilada. Overall, was good but, in my opinion, not as well constructed as the intricate shrimp ravioli dish… so definitely share to avoid disappointment. The dessert course was a nice surprise – you don’t have to choose as you get them all! But, unlike the three dishes listed on the Winterlicious menu, it’s actually two things with the panna cotta and chocolate mousse merged into one. The table’s unanimous favourite was the crispy hot apple purse. 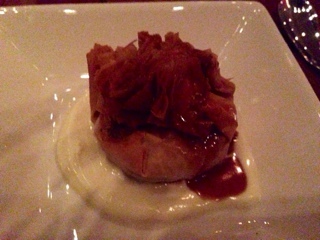 A cinnamon apple mixture is wrapped into a crispy phyllo pastry and topped with a warm caramel and cool cream. This is a delicious take on apple pie! Personally, I love desserts that incorporate a hot and cold element so this did not disappoint. On the other hand, the panna cotta and mousse was a bit too much. With jarred desserts I usually dig right into the bottom to make sure each spoonful incorporates all the different layers of flavours, but this one just had way too much going on. At the top is a chocolate coriander mousse topped with puffed rice, which if by itself would have been quite nice with the combination of smooth mousse and crunch rice bits. The bottom half was a vanilla panna cotta topped with an apricot preserve and raspberry coulis; also had potential to be quite refreshing if served on its own. Together though, the dessert is the chocolate and fruit blend I detest and the coriander chocolate actually added a bitter tinge to the dish. My suggestion … split this dessert into a trio; I think it would work much better. As a special feature to the Winterlicious blogs, I will attempt to calculate the savings being offered (based on my meal selection). * The dessert price based on similar items in the menu.